The ordinance specifies the components in one-inch units: The star is 9 units high and wide, formed by 4-unit-radius quarter-circles. The center point of the star is 26.5 units from the hoist and 17 units from the top. The canton is 18 units wide by 13.5 units high, the second quarter is 30 units wide and 8.5 units high, the third quarter is 23 units wide and 8.5 units high, the fourth quarter is 25 units wide and 13 units high. The blue stripes are 4 units wide, the white stripes are 1 unit wide, and the yellow stripes are 2 units wide. (These result in a flag 34 units high by 60 units wide.) The colors are Kelly or Irish Green, U.N. Blue, Gold, and White. Green symbolizes Oregon’s forests, which surround Portland. The vertical and horizontal blue stripes represent the Columbia and Willamette Rivers, with the central white star (hypocycloid) signifying Portland at their confluence. The yellow stripes symbolize the harvest of golden yellow grain (Portland is a major international exporter of wheat) and the gold of commerce. The white stripes are merely decorative. The offset cross is not intended to resemble a Scandinavian cross. In July of 2002, the Portland Flag Association, including NAVA members Doug Lynch, Mike Hale, Harry Oswald, John Hood, Ted Kaye, and Mason Kaye, proposed an adjusted and improved version of the 1969 flag, with four major changes: removing the city seal from the canton, changing the canton to green, doubling the width of the blue stripes, and enlarging the central star to nine times its former size. Working with the mayor’s chief of staff, Sam Adams, the group drafted the ordinance and testified before city council on behalf of the new flag. Mayor Vera Katz applauded the initiative and oversaw the raising on the council chambers’ pole of the first new flag (manufactured and donated by Elmer’s Flag & Banner). Flag adopted: 4 September 2002 (official), originally adopted 1969. Douglas Lynch, 89, a nationally-known, award-winning graphic designer, created this revision of his previous flag. Believing his original design could be simplified, and seeking an opportunity to remove the city seal placed upon it by the former city council, he developed a new version after his presentation to the Portland Flag Association on the history of the 1969 flag. To allow for normal attrition in flag stocks, the ordinance of adoption made the previous flag equally valid until 31 December 2004. In the 1980s, the city’s Office of Neighborhood Associations sponsored the development and adoption of flags for the city’s 70+ neighborhoods, modeled in proportion (3:4) on the flags of Sienna, Italy. These flags are occasionally displayed in city hall. The City Flag flies in front of the Portland Building (5th Avenue) and City Hall (4th Avenue), in Pioneer Courthouse Square, and on many other commercial buildings around the city. It also hangs in the City Council Chamber and the Portland Building's 2nd-Floor Auditorium. In April 1969 the Commercial Club of Portland proposed a flag for the city, asserting that previous designs had never been officially adopted. That proposal consisted of a white field with the city seal in gold in the center, flanked by two red roses with World Port of the Pacific above and City of Roses below. Mayor Terry Schrunk referred the design to the Portland Art Commission. Mrs. Gus (Libby) Solomon, chair of the commission, instead announced a plan to hire a qualified designer to design an official Portland flag for $500. She invited Douglas Lynch, former commission chair and prominent graphic designer to compete. He declined, describing the process of creating and adopting an acceptable flag as “a project where even angels fear to tread”. Instead he offered to draft criteria “by which an appropriate flag might be created”, and polled the members of the city council and art commission in writing concerning the general character of the flag, color choice, and the use of the city seal. He found that all four city council members and none of the nine art commission members favored using the seal. At Mrs. Solomon’s urging, Lynch relented and designed a flag. On a field of bright medium green, its light blue stripes represent the Columbia and Willamette rivers in an offset cross, set toward the hoist. The stripes are fimbriated in white, gold, and white, with proportions of 1:2:1:2:1:2:1. Their intersection forms a small four-pointed star (a hypocycloid) in white, representing the city at the confluence of the rivers. Overruling Lynch’s preference, the city council altered his final design, changing the canton to a dark blue and adding the city seal. The canton is dark with the seal centered in yellow and white. The dimensions of the canton are 13:14; the upper fly quarter, 11:36; lower hoist quarter, 11:16, and the lower fly, 13:34. The width of the cross figure is 10 units. The city council adopted the flag by ordinance amid lively citywide discussion on 8 January 1970. Lynch called the design process “as much diplomatic as it was artistic”. In December 1957, the Lang Syne Society, composed of “senior citizens of Portland who have been engaged in its businesses, industries and professions for 30 years or more”, launched a contest among the local high schools for a city flag design. The society felt that Portland, one of the only large cities without a flag, needed a municipal flag. Among 51 designs, the prize of $200 went to the winner, Philip Schaffer of Franklin High School, at the 2 April 1958 meeting when the flag was introduced to the city council by city commissioner Ormond R. Bean. Although the flag was not adopted officially, the Lang Syne Society did have a flag made and presented it to Mayor Terry Shrunk on January 1, 1959. It hung in the council chambers until 1970. The flag has a medium blue field, with proportions of 3:5. At the hoist, about one-sixth of the field’s length, is a vertical gold stripe on which 1851 (the year of the city’s incorporation) runs downward vertically in large black numerals. Centered on the remaining blue portion of the field is a circular figure depicting the city’s pioneer beginnings, although it is not Portland’s official seal. The circle is bordered by a green ring edged on both sides by a narrow yellow line. Centered over the top portion is Portland, in black, clockwise. On the lower portion, beginning about at 8 o’clock and ending at about 4 o’clock, appears Rose Festival City, also in black (several other cities were also known as “The City of Roses” at the time, so “Festival” was added as a distinction). On either side of the ring, centered are two roses, yellow over red, with stems and leaves. The central portion of the circle shows a snow-capped mountain scene with evergreen trees, and in the center foreground is a covered wagon and a pioneer cabin. The diameter of the circle is about one-third of the length of the entire field. In June 1950, Mayor Dorothy McCullough Lee sought a municipal flag to fly along with the state flag. Benson High School’s band director Norman Street worked with art teacher Harry Matheson to design a flag. It consists of the city seal centered on a white background. City of Roses appears centered above the seal, and Portland, Oregon appears centered below. Although Mayor Lee liked the flag very much, she failed to have it adopted, perhaps because of her rocky relationship with the city commissioners. While she had promised to use “whatever legal hocus pocus” necessary to make the flag official, one commissioner later reported “Mrs. Lee might have ‘hocused’, but she forgot to poke us.” However, a flag was manufactured, and Benson’s marching band and armed color guard carried it for several years in the annual Rose Festival Parade. In 1917, Mayor Harry R. Albee appointed a committee to ascertain if Portland needed a flag to accompany its new slogan, “Your Portland and Mine”. The committee examined the flags of 31 other prominent U.S. cities and determined Portland should have a flag, appointing Morris H. Whitehouse to lead a flag design contest. Having published extensive specifications, the committee received several proposals. Design number 8, by H. W. Frederick, won first place and $25. It is a horizontal tribar of equal white, blue, and white stripes, the blue stripe representing the Willamette River. A red circle centered on the blue stripe represents the city of Portland. However, the committee found that the best design did not measure up to the standards outlined in the contest guidelines. The flag did not appear to have “certain important requisites, such as historical association dating back to the earliest periods of the city’s history”, as Whitehouse made clear in the specifications. The flag did not express any apparent “robust civic ideal” or “common aim and purpose”, nor did it convey “civic spirit”. Joining the patriotic fervor of World War I, the committee recommended that Portland instead fly the Stars and Stripes for the time being. The Frederick design was never adopted. 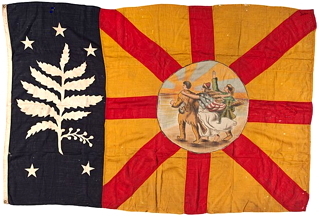 "This is an extremely rare 1905 Lewis & Clark flag from the original World's Fair and Exposition in Portland, Oregon. The Oregon Historical Society says it may be 1 of only 2 in existence. The flag has been matted and framed. The frame measures 43" X 31"." The official emblem symbolized the arrival of the explorers at the Pacific Ocean. In the foreground were the figures of Lewis and Clark, with the Goddess of Liberty marching between them. In the distance was the setting sun and the wave-washed ocean shore. The emblem was greatly admired for its strength and life. The colors of the official flag were red, white, blue, and yellow, a union of the national colors of the United States, Great Britain, Russia, France and Spain, in recognition of their explorations of the Northwest Coast and search for the Northwest Passage. That part of the flag corresponding to the starry field of the American flag was a blue field bearing in white, a flowering grape, surrounded by five stars, representing Oregon, Washington, Idaho, Montana and Wyoming, the five states of the old Oregon Country. The remainder of the flag was a square, yellow field crossed by four red bars in the form of a St. George's cross. The bars and the yellow field represented the five nations above referred to, while the yellow was symbolic also of the Oriental side of the Exposition. In the center, in a circle, was the official emblem in colors.